"A soft teacake that is best when one to two days old. You can change flavors by substituting almond or lemon extract for the vanilla. Add a few drop of food coloring to dress up the dough for special occasions. " In a medium bowl, cream together the butter and sugar until smooth. Beat in the eggs one at a time, then stir in the vanilla. Combine the flour, baking soda, salt and nutmeg; stir into the creamed mixture. Knead dough for a few turnns on a floured board until smooth. Cover and refrigerate until firm. Preheat the oven to 325 degrees F (165 degrees C). On a lightly floured surface, roll the dough out to 1/4 inch in thickness. Cut into desired shapes with cookie cutters. 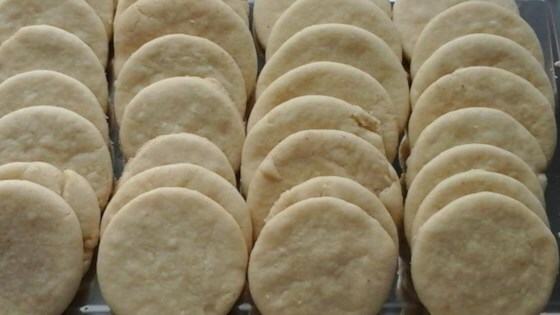 Place cookies 1 1/2 inches apart onto cookie sheets. WHERE IN THE WORLD DID YOU GET MY GRANDMOTHER'S RECIPE!!! !THESE WERE JUST LIKE THE ONES I REMEMBER WHEN I WAS LITTLE!!! !THANKS A MILLION!!!! THIS IS THE OLD FAASHIONED RECIPE I HAVE BEEN LOOKING FOR. IT'S JUST GREAT. I'LL PASS IT ON TO MY KIDS!!!!!! My great aunt used to make teacakes. She died and did not leave us the recipe. My teacakes turned out great! Just like my aunt.